The last time the U.S. marketplace saw a new-model Jeep® Cherokee was 2001. Ten years later, the Cherokee made Kiplinger’s list of 10 Cars that Refuse to Die, despite their own “no trucks” rule for the list. Whether Kiplinger knows something the rest of the world doesn’t, or they are just calling it like they see it, the Cherokee is back. With a vengeance. Jeep’s new 2014 Cherokee packs a punch for power, technology and looks and can be financed or leased through Chrysler Capital. I started looking at the 2014 Jeep® Cherokee as soon as I heard it was coming back, sometime last spring. I think the first words out of my mouth when I saw it were, “That thing is a beast!” And I immediately knew that was going to be my next vehicle. Little did I know at the time, but this “small” SUV really is a beast. With 271 horsepower available and 4,500 pounds of towing capacity, it far exceeds other SUVs in its class. Will I ever need that kind of power beneath the hood? Not likely. I doubt I’ll ever tow anything at all, let alone something that weighs 4,500 pounds. But I COULD and that’s just awesome. ward collision warning. One of the most important ones to me, as a small SUV driver myself, is the available blind spot/cross-path monitoring that will triple-check my double-check. For the technology buff, the Cherokee hits the mark here too. The available, award-winning connectivity includes navigation with 3-D landmarks and terrain maps, SiriusXM® Travel Link and SiriusXM® Satellite Radio, voice text reply, and Uconnect™ access, just to name a few. Plus, there’s a wireless charging pad for your phone and climate control to keep everyone comfortable. But this is really just a snapshot of what’s available. To get a true idea of all the available options, visit www.jeep.com/en/2014/cherokee/. Described on Jeep’s website as “a bold design steeped in Jeep® brand heritage,” the look of the new Cherokee is fierce. It’s sleek, and modern, yet rugged and soulful. You can easily take this beauty from off-roading during the day to a night on the town with a simple run through the carwash. 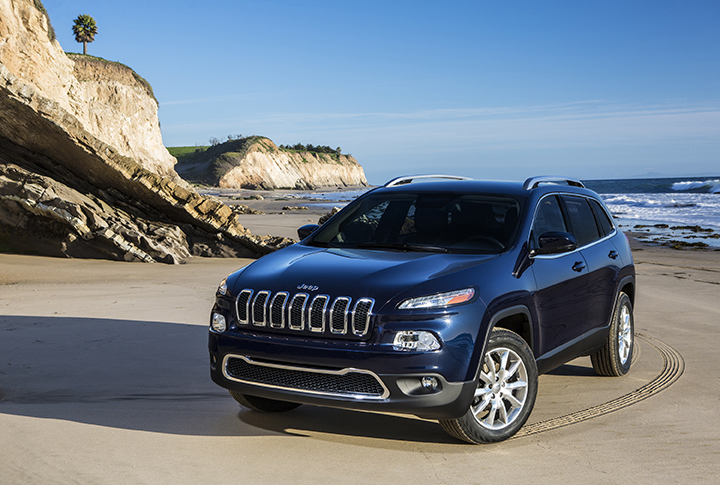 With four available trim lines and an MSRP starting at $22,995, the Jeep® Cherokee is definitely the SUV that can. You can too. It’s easy and you can save time at the dealership when you apply for financing online with Chrysler Capital.